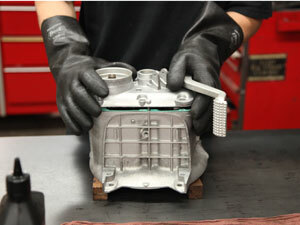 BMW riders from around the country and beyond send components to Virginia Motorrad for repair. Transmissions, final drives, engines, water pumps, we see it all. For technical articles on these components, look at Anton's website. Transmissions: Airhead circlip grooves are cut on site. 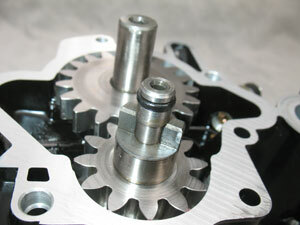 Gearing modifications are available for Airhead and some Oilhead transmissions. General overhaul and repair for all 1970 through present. Correction of 'skipping' problem or input shaft wear on 1994~2000 Oilheads. 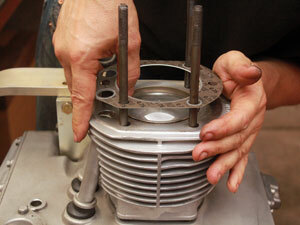 Stripped spline repair on 1150-style 6-speeds. Some custom gear ratios including hybrid Enduro transmissions with overdrive 6th. Final drives: 1970 through present. Wheel spline repair on Twinshock Airheads; driveshaft spline repair on K75/K100. Bearing failures on some newer ones are due to incorrect shimming from the factory; every final drive gets set up properly from scratch. Pinion seal leaks fixed. Custom ratios can be installed. Nylatrol bushings to replace the marginal bearings that BMW used for the Paralever pivots. K water pumps: Small job but someone has to do it; overhaul is about a quarter the cost of a new pump and is very reliable. The right tools aren't worth buying for you to just do the job once. The final drive design used on nearly everything from the R80G/S through the K1200LT typically fails at the main ring gear bearing, which also serves as the axle or wheel bearing, due to excessively tight shimming. Additionally, the opposite bearing may be worn or may be loose on its mount, and the pinion shaft bearings can be worn. Frequently the backlash is excessive which may accelerate bearing wear. Repairs on these final drives start at around $400 and quickly get beyond $600 if the pinion bearings are bad. If the bearing mount is worn we may be talking about replacing the gearset, as that mount is part of the ring gear assembly. You can see the parts I'm talking about in the article I wrote for OTL. The typical problem on those EVO final drives - and the problem is limited to the pre-2010 unvented ones - is that the big bearing dries up and fails, and there is nearly always heavy wear on the pinion bearings. Backlash is usually too large and the shims to adjust that are expensive (about $50). A typical repair is $750~850 (three bearings, seals, new shims, and labor). You need to understand that there is a small chance that in the future the new big bearing will start to spin on the axle which effectively ruins the gearset and therefore the final drive. New gearsets are available to repair this (currently around $500) and I would certainly work with you on a follow-up repair for this, but it's a different repair and not a problem with the original repair. For this last reason many shops no longer repair these units. I describe this and other problem with this transmission family on my tech pages. The gears will need machining which will be about an $800 fix, and that is in addition to the regular labor and materials that go into the job. You should expect the complete repair to cost $1300 to $1500. Yes, you can buy a used transmission for less than that but it won't be as good. The baseline overhaul (five bearings, seals, labor) is about $650 at this point with actual repairs bringing additional parts costs but generally not more labor. Minor repairs like adding the circlip to an '85~94 transmission or fixing a broken pawl spring could be less, as an overhaul may not be called for. The minimum cost for any repair is probably about $400, because every repair involves opening, inspecting, cleaning, reshimming and probably a seal or two.